Prince Harry And Meghan Markle Revealed Their Official Engagement Photos And We Can't Control Our Excitement! Queen Elizabeth’s 33-year-old grandson, Prince Harry, fifth-in-line to the throne, and Megan Markle, the beauty-with-brains from US TV legal drama Suits, have again left the internet aghast! 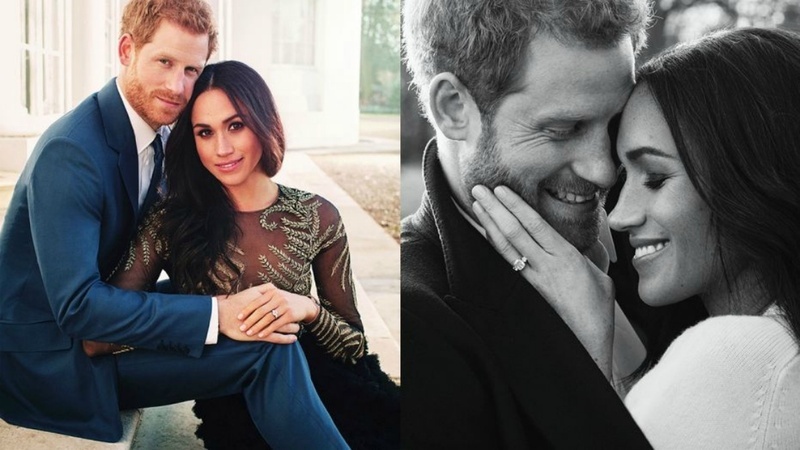 After announcing their engagement last month, they have now released their official engagement pictures, the latest milestone on the road to their wedding next year. The pictures are shot by Alex Lubomirski, a day after the pair joined the Queen and the rest of the royal family for Christmas lunch at the Buckingham Palace. The pictures consist of a black and white portrait of the couple embracing face-to-face, along with a picture of them cuddling together holding hands! Harry designed the engagement ring in a way that it features a diamond from Botswana accompanied by two smaller diamonds from Diana's jewelry collection, which the Prince said he wanted to include "to make sure she's with us on this crazy journey together." The other one has the couple sitting hand in hand on the steps of Frogmore. Prince Harry is dressed in a blue suit while Ms Markle is wearing a black and gold embroidered dress by British luxury fashion house Ralph and Russo. Kensington Palace later released a third photo "as a way to say thank you" for all the "warm and generous" messages the couple had received. Prince Harry and American actress Ms Markle confirmed their engagement in November and last week announced the service would take place on 19 May. New York-based photographer Mr Lubomirski was a former assistant to Mario Testino, who created some of the most famous images of Prince Harry's mother, Diana, Princess of Wales. He said: "It was an incredible honour to be asked to document this wonderful event, but also a great privilege to be invited to share and be a witness to this young couple's love for one another. I cannot help but smile when I look at the photos that we took of them, such was their happiness together." The relaxed appearance of Prince Harry and Megan contrasts with the official engagement photos of his late mother Diana, Princess of Wales, and his father Prince Charles, taken outside Buckingham Palace in February 1981. Now only time can tell, how the American actress will take her role as the British royalty!